Introduction: The seventh century is one of the most crucial in English history, for it was then that Christianity was firmly established among the Anglo-Saxon kingdoms. Part of this conversion’s effect on England was certainly to change its perceived boundaries and its relationship with the rest of the Christian world. Within a hundred years, England went from an island dominated by the individual kingdoms of pre-literate Anglo-Saxons to one able to produce a work of illuminated text – the Lindisfarne Gospel –that rivaled any produced on the Continent. By early in the eighth century, the English-educated monk Winfrith, who would come to be known as St. Boniface (675-754), was bringing Christianity to the continental kin of the Anglo-Saxons. England began in the fifth century as Roman Britain conquered, but England converted was not Britain reborn. Its system of government, its economy, and even its vernacular language had changed during the fifth and sixth centuries. But even so changed, after a century and a half of darkness during which its history lay mostly unrecorded, with the coming of Christianity England was once again part of Europe. That broad change, though, was not the goal of the mission that went from Rome to England in 596. Their goal was clear to Bede (672-735), the great historian of the English conversion, who in his 731 Historia Ecclesiastica Gentis Anglorum (Ecclesiastical History of the English People) presents the tale of the Anglo-Saxons “snatched from the wrath of Christ and called to his mercy.” Bede tells how the Anglo-Saxon invaders who had established themselves in what was now England became Christian by means of the conversion of their kings. Over the course of the seventh century, even those kingdoms that resisted Christianity, such as the kingdom of Mercia long held by its pagan king and warlord Penda (r. 626-654) , came to Christ. The pious Cenred (r. 704-9), who abdicated the Mercian throne in order to go on pilgrimage to Rome and enter holy orders there, ruled Mercia only 76 years after Penda had dismembered the Christian Northumbrian king Oswald (r. 634-642) at the battle of Hatfield. Bede’s history is that of men acting to further the providence of God. Recent scholarship on the Anglo-Saxon conversion makes a much different claim: that this religious change was not provident, but expedient. It presents Christianity as a tool that supplied Anglo-Saxon kings with a ready-made structure of power they could use to exert and support their own power and authority. This interpretation puts the conversion of the Anglo-Saxons into the social context with which we can best evaluate it. For that evaluation to be complete, however, we need to look at more than just political necessity, and we need to account for those kingdoms that resisted religious change. 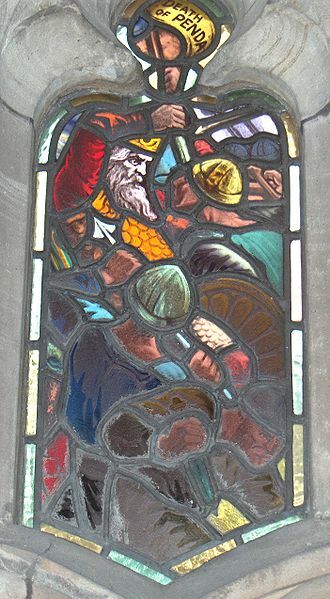 Examining the conversion of the kingdom of Mercia from the perspective of that kingdom’s origins and development and its rulers’ interests and concerns will enable us to understand both resistance and conversion to Christianity in seventh-century England.